We just signed up as an official "Merchant Member" at Reseller Ratings. 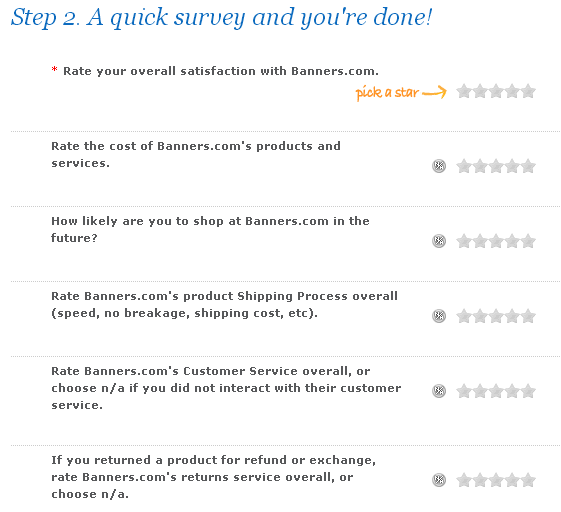 We would love to hear about your Banners.com experience! All you have to do is fill out a quick review. You can get started on your review by clicking here. In this step you will write anywhere from 25 characters to 5000 characters about your order experience. There are a series of questions related to Banners.com products, shipping, customer service and user experience that you will rate with a star. When you are done, click on the "Finish and Share It" Button and your review will be posted! You can get started on your review by clicking here.